The Big Island of Hawaii is the largest of the Hawaiian Islands and is situated in one of the most ideal climate zones, making it one of the best destinations in the world for golf. Along with perfect weather conditions year-round, golfers are sure to find breathtaking courses that suit a variety of skill levels. Here, golfers can play amongst ancient lava flows and historical landmarks, while witnessing spectacular views of the Pacific. If you come to Hawaii to lower your handicap or simply want to relax and enjoy a round with friends, the Big Island will not disappoint. Are you ready to hit the links? Explore our vacation rental golf packages at ResortHawaii.com. Our Waikoloa Beach Resort Gold Membership golf benefits extend to the guests of rented units and include discounted tee fees at the Waikoloa Beach Resort courses. Browse our golf packages today to find your perfect Big Island vacation rental. Before you pack your bags, take a look at some of the best Big Island golf courses Hawaii has to offer. Contact information for each course can be found in our Golf Directory. Waikoloa Beach Resort Golf: Cut out from a lava field, the Kings’ Course is a fantastic place for mainlanders to practice and perfect the game. Golfers will find generous fairways as well as challenging water holes to keep the game fun and interesting. The stunning contrast of black lava against the greens is also sure to provide you with a memorable experience. Muana Lani Resort: There are two golf courses you can choose from at Muana Lani Resort. The North Course is built on a lava bed and punctuated by the Kiawe forests. This course has quickly become one of the most popular tournament venues on the whole Island and provides a good test of golf. Over on the South Course, golfers can take in the dramatic backdrop of black lava rock and sweeping views of the sea. Muana Kea Golf Course: Originally designed by the great Robert Trent Jones Sr., Muana Kea Golf Course is one of the best you’ll find on the Island. Natural beauty, dramatic views, and an innovative design encompass all the values of what golf should be. Thanks to a stunning renovation by Rees Jones in 2008, Muana Kea has transformed into a nearly perfect golf course with new tees, fairways, bunkers, and greens. If you need more convincing, this course has consistently held a spot in Golf Digest top 100. Makani Golf Club: Formally known as the Big Island Country Club, Makani Golf Club is characterized by its wildlife, stunning views of the 14,000-foot Muana Kea Volcano, and high elevation above the shoreline. In addition, bentgrass greens offer an ideal putting surface to help improve your game. Kona Country Club: The Ocean Course at Kona Country Club is one of the Island’s most under-rated golf courses. After recently undergoing a two-year renovation to upgrade the irrigation system and refurbish the tees, fairways, bunkers, and greens, the course reopened in 2015 to provide players with a fresh look and new challenges. A remarkable landscape and lower green fees truly make a winning combination. 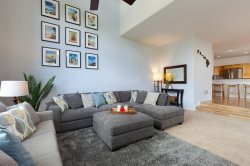 If you’re ready to dust off your golf clubs this winter, find your perfect vacation rental on the Big Island at ResorticaHawaii.com. We are your one-stop destination for booking the best holiday properties and most comprehensive Hawaii golf packages. experience all the incredible things Hawaii has to offer. Our friendly and knowledgeable staff is here to help you find the ultimate home base so you can get the most out your next vacation. Book your next vacation rental at ResorticaHawaii.com by calling us at 808-881-8222 or browse and book online. For all other questions or interests you can fill out our online form and our team will be in touch with you soon.